(Nanowerk News) Glioblastoma multiforme, a cancer of the brain also known as "octopus tumors" because of the manner in which the cancer cells extend their tendrils into surrounding tissue, is virtually inoperable, resistant to therapies, and always fatal, usually within 15 months of onset. Each year, glioblastoma multiforme (GBM) kills approximately 15,000 people in the United States. One of the major obstacles to treatment is the blood brain barrier, the network of blood vessels that allows essential nutrients to enter the brain but blocks the passage of other substances. What is desperately needed is a means of effectively transporting therapeutic drugs through this barrier. A nanoscience expert at Lawrence Berkeley National Laboratory (Berkeley Lab) may have the solution (Journal of Controlled Release, "Self-assembled 20-nm 64Cu-micelles enhance accumulation in rat glioblastoma"). 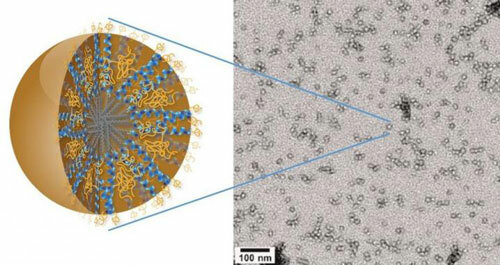 Ting Xu, a polymer scientist with Berkeley Lab's Materials Sciences Division who specializes in self-assembling bio/nano hybrid materials, has developed a new family of nanocarriers formed from the self-assembly of amphiphilic peptides and polymers. Called "3HM" for coiled-coil 3-helix micelles, these new nanocarriers meet all the size and stability requirements for effectively delivering a therapeutic drug to GBM tumors. Amphiphiles are chemical compounds that feature both hydrophilic (water-loving) and lipophilic (fat-loving) properties. Micelles are spherical aggregates of amphiphiles. "Our 3HM nanocarriers show very good attributes for the treatment of brain cancers in terms of long circulation, deep tumor penetration and low accumulation in off-target organs such as the liver and spleen," says Xu, who also holds a joint appointment with the UC Berkeley's Departments of Materials Sciences and Engineering, and Chemistry. "The fact that 3HM is able to cross the blood brain barrier of GBM-bearing rats and selectively accumulate within tumor tissue, opens the possibility of treating GBM via intravenous drug administration rather than invasive measures. While there is still a lot to learn about why 3HM is able to do what it does, so far all the results have been very positive." Glial cells provide physical and chemical support for neurons. Approximately 90-percent of all the cells in the brain are glial cells which, unlike neurons, undergo a cycle of birth, differentiation, and mitosis. Undergoing this cycle makes glial cells vulnerable to becoming cancerous. When they do, as the name "multiforme" suggests, they can take on different shapes, which often makes detection difficult until the tumors are dangerously large. The multiple shapes of a cancerous glial cell also make it difficult to identify and locate all of the cell's tendrils. Removal or destruction of the main tumor mass while leaving these tendrils intact is ineffective therapy: like the mythical Hydra, the tendrils will sprout new tumors. "3HM is a product of basic research at the interface of materials science and biology," Xu says. "When I first started at Berkeley, I explored hybrid nanomaterials based on proteins, peptides and polymers as a new family of biomaterials. During the process of understanding the hierarchical assembly of amphiphilic peptide-polymer conjugates, my group and I noticed some unusual behavior of these micelles, especially their unusual kinetic stability in the 20 nanometer size range. We looked into critical needs for nanocarriers with these attributes and identified the treatment of GBM cancer as a potential application." Copper-64 was used to label both 3HM and liposome nanocarriers for systematic PET and MRI studies to find out how a nanocarrier's size might affect the pharmacokinetics and biodistribution in rats with GBM tumors. The results not only confirmed the effectiveness of 3HM as GBM delivery vessels, they also suggest that PET and MRI imaging of nanoparticle distribution and tumor kinetics can be used to improve the future design of nanoparticles for GBM treatment. "I thought our 3HM hybrid materials could bring new therapeutic opportunities for GBM but I did not expect it to happen so quickly," says Xu, who has been awarded a patent for the 3HM technology.